Since the beginning of the day the situation has worsened in Donetsk sector of Donbas conflict area, where militants used grenade launchers and machine guns. This was stated by the press center of the Ukraine’s Army HQ. It is noted that terrorists shelled positions of the Ukrainian military near Zaitseve, Avdiivka, Pisky and Luhansk from large-caliber artillery. 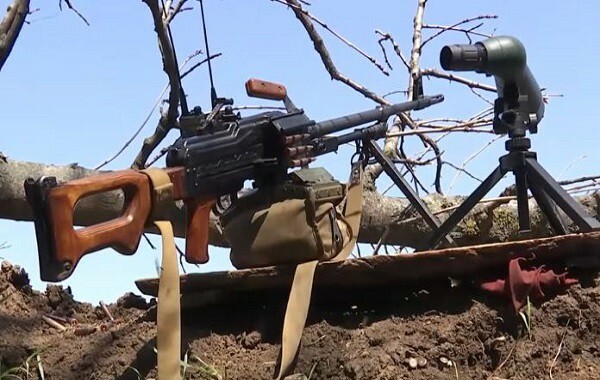 "Militants shelled Ukrainian army’s positions near Zaitseve, Avdiivka, Pisky and Luhansk from various types of grenade launchers and machine guns, and at about 12:00 Ukrainian serviceman was wounded by enemy fire from small arms near the village of Kamianka," the report said. In Luhansk and Mariupol are it was not calm also, the enemy shelled Troitske, Krymske and Vodyane. In total, from the beginning of the day the enemy violated the ceasefire regime 13 times. As it was reported earlier 317 Ukrainian artillerists of the Armed Forces of Ukraine died in the fight against the Russian aggressor. President Petro Poroshenko claimed this at the solemn events dedicated to the Day of Missile Forces and Artillery. He noted that 70% of the missions are performed by the artillery.